These days everyone seems to be partying throughout December and into the New Year and long may it continue! From those slightly embarrassing moments at the work's Christmas party to those unforgettable nights out with friends, just rock your own style and do it with a touch of class. Well that's my advice anyway! That Friday feeling is pretty good in any week of the year but there seems to be something extra special about the festive-feel Fridays in the lead up to the holidays - a distinctive air of excitement don't you think? So in true Brit Decor fashion, here's a celebration of Festive Fridays - palette style. A sophisticated blend of smokey evening pinks and purples with bolts of fresh white lights to enliven the senses. I love the suspended ceiling pendant decorations on coloured chords as they float amongst the dreamy metallic balloons like no.2 from the Wedding Mall. Candlelight is a 'must have' for that party-meets-dinner look and this beautiful Tallow candle (no.4) in a luxurious Burgundy really fits the bill and is available from The Conran Shop. With so much hype currently surrounding the roaring 1920's the Grande Gatsby cushion makes a popular return to Brit Decor but this time in 'Majestic Purple' from Aura (no.5). 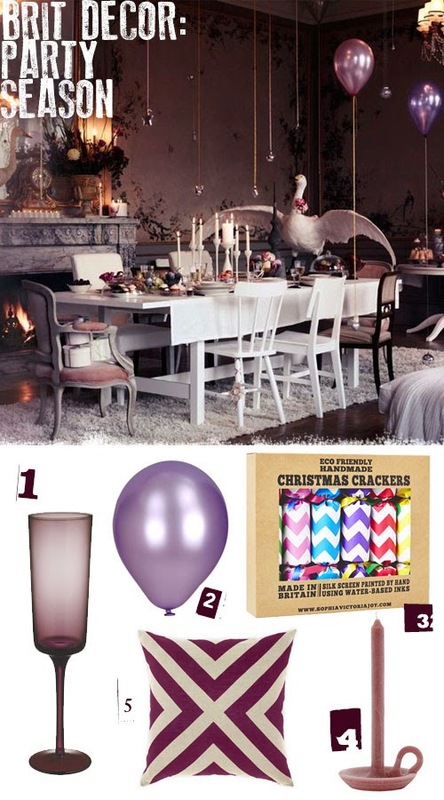 To really celebrate in style, the party would not be complete without the bubbly so time to bring on this very seductive Devon champagne glass (no.1) from Habitat and of course, a festive party really wouldn't be the same without these vibrant handmade Christmas crackers (no.3) from Not on The High Street!